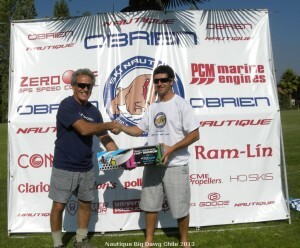 What’s going on in Chile for the Nautique Big Dawg World Tour? The Nautique Big Dawg World Tour in Chile on Saturday was full of excitement as skiers competed for the Sweet 16, then immediately into the Elite 8, followed by the Final 4 with once again Andy and Todd going head to head competing for the win. Todd finished the day with 1.5 at 41 and Andy went for the win with 2 at 41. We would like to thank the sponsors for supporting the Big Dawg and also Miranda’s Ski School for their hospitality and great conditions. A big thank you to officials, skiers and everyone who helped organize the event. Next stop, Moomba. View the scores and final brackets. It’s only February and the first tournament of the year for some of the Big Dawg skiers and many admitted to being nervous on the dock. Miranda’s festive atmosphere with music and enthusiastic skiers, helped to calm the nerves. There was a newcomer in the middle of the pack, Rodolfo Guzman. He pulled out a clean 4 at 39 (10.75) early on in the running order. He may be one to watch on Saturday for the 2nd round. Saturday will be exciting because the skiers will compete in the 2nd round at 10:00am Chile time, then a short break to organize the brackets for the Sweet 16, followed by the Elite 8 and Fabulous Final 4 to determine our winner. The Sweet 16 will be determined by the best score of the two rounds and 8 spots are reserved for Latin American skiers. For photos and more information, LIKE us on Facebook and check in for more details soon. Follow us on Twitter @skibigdawg for up-to-date information. Thanks to PTM Edge for donating a panoramic mirror and congratulations to our winner. Greg Davis presenting Camilo Mena PTM Edge panoramic mirror he won in a drawing. 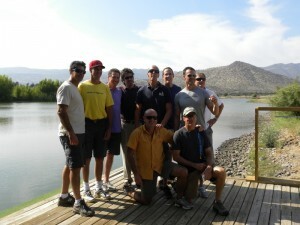 Wednesday was a day to explore the canyons and visit a restaurant on the raging river called La Tribu. This campground-style restaurant has a chic outdoor eating area and just below your table is a river that is mad with rushing water. You would not think for such a dry climate that water would be so abundant, but it is coming from the tall mountains that surround almost everywhere your eye can see. Thursday was an adventure as “The Americans” navigated their way to a cow pasture trying to find Chilean Ruben Rosenberg’s lake. After the Italian, Fabrizio Merlo raced to the Americans rescue, and found them going in the wrong direction, there was finally some practice skiing behind the new Nautique 200 on this beautiful setup. The water temperature is about 80 degrees and the sky is full of sun. After skiing, Ruben escorted the crew to a very local restaurant called La Ruca. La Ruca serves meat on little grill fireplaces at your table complimented by fresh vegetables and potatoes. Todd Ristorcelli was given a Dr. Seuss-style balloon hat as a souvenir, but we don’t know why. A visit to another Chilean lake was spectacular with its surroundings, and little pup Kotarsky was forced to ski on a borrowed ski with borrowed gloves and borrowed handle and there was some success rounding one buoy and a nice crash for the Editors camera. Upon return back to Miranda’s ski site, reality set in because banners were in place, Nautique Boats were pulling practice and rows of tables and chairs were ready for the start of the event on Friday. 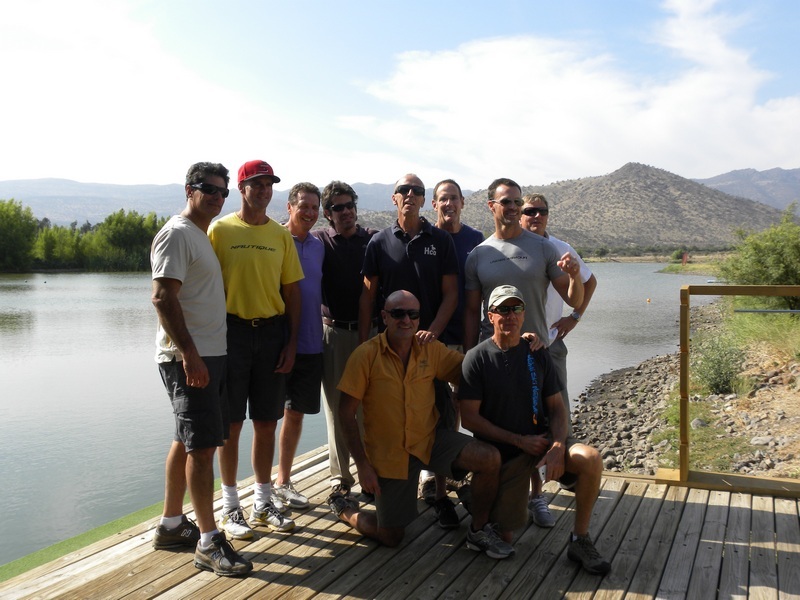 Big Dawg skiers take to the water at 1:30pm Chile time. For photos and more information, LIKE us on Facebook and check in for more details soon. Okeeheelee skier, John Shealy, AKA Juan Chealy, took the week to ski at Miranda’s ski school along with Tim Huston, Jeff Smith, Ed Hickey, and Andy Mapple. Last year, Shealy traveled to Peru for the Big Dawg and was crowned the name “Juan Chealy.” This came about because he was anxious for practice time and the practice segments were going by country. Every time it was his turn to ski, there was a mechanical issue, break for lunch, or equipment failure. The South American team, mainly instigator Ruben Rosenburg decided to adopt the American but he needed a new name, therefore, John Shealy, became Juan Chealy and was moved to the top of the practice list with the Latins. Before leaving West Palm Beach, John spent most of his time in the gym doing his typical winter training. The weather in Florida has been superb, so he was able to kick up the skiing and get some short-line training at 39 off. In Chile, he plans on skiing two sets a day before the competition. Skiing on a foreign lake with different conditions has its challenges. He focuses on balance and rhythm and his Goode Nano One gives him the confidence he needs in unknown waters. John has skied many tournaments in Miami that were part of the Latin American Tour, and has had the opportunity to meet the Latin skiers and become good friends with most of the group. One of his memories from the Peru stop last year was going to Juan Carlos’s beach house for lunch and the amazing atmosphere and food served. John travels to the Latin Big Dawg because he enjoys the southern hospitality and positive attitude of the series. Last year in Peru, John landed on the podium with a bronze medal and he hopes to stand on the box again this year. He has run 5 at 39 many times in a record tournament so he will be part of the top skiers in the boxing ring for a placement.